My only explorations with watercolors before now have been via Derwent Inktense pencils or the Koi Watercolors Pocket Field Sketch Box, which has pans of paint. And really I’m such a beginner I don’t even know proper mixing or painting techniques yet anyways. But have slowly started researching tube paints for when I’m ready to make that next step up in my art supplies. But THEN, I opened up my Christmas stocking to discover some Reeves Watercolors tubes! Yes, I know enough from my research to realize that they are student-grade, economical entry-level paints, but I’m okay with that – I’m still learning the basics anyways! I can upgrade later once I make full use of these. 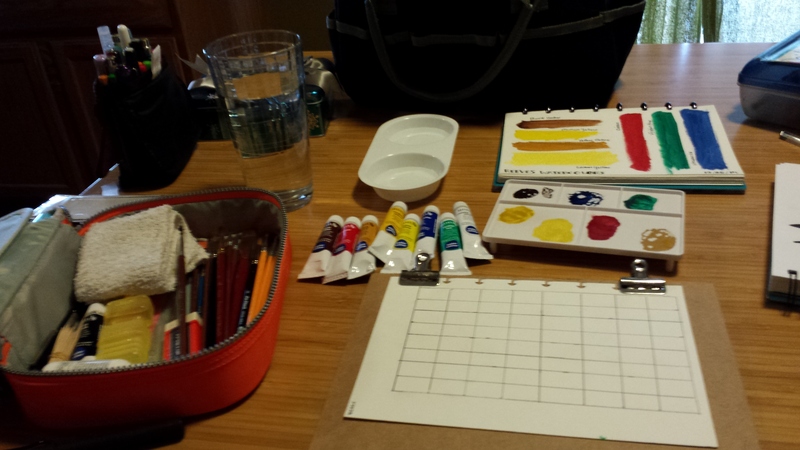 I received a limited palette of 9 colors: black, white, brown, red, green, blue and three yellows. So I started by making a color chart following the tutorial here. Using a sheet from my 9 x 6 discbound sketchbook, I decided to skip the black color to avoid a chart that was too dark, and just used the others. So created a table with 8 rows and 8 columns. It was a learning experience trying to determine the optimum amount of paint needed to mix the colors without wasting any. The resulting color chart I actually think is pretty ugly. A very 70’s mix of dark oranges, greens and browns. But this could just reflect my mixing inexperience too! So I will continue playing and try again in the future. Also, most people quote their teachers saying, as mine did, to get the best quality you can afford. 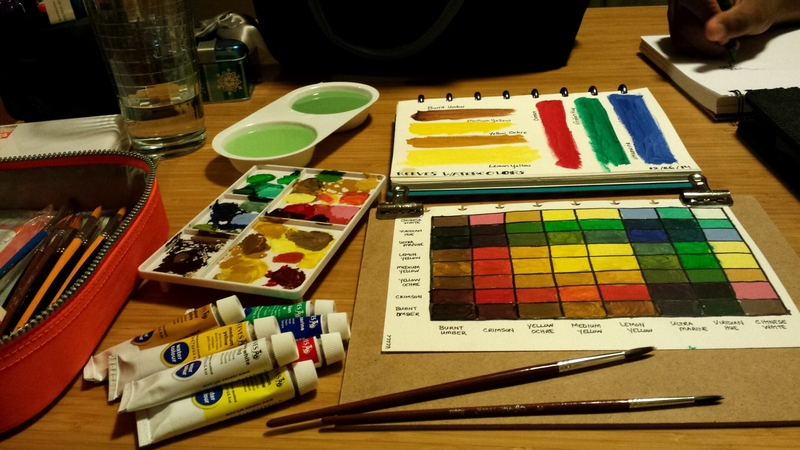 When learning, you’ll be less frustrated when using Artist grade paper, paint and brushes. I had that Koi kit and kicked to the curb after about 3 months. I like the configuration of the box but hated the quality of the paint. Daniel Smith, Windsor Newton, and some others are good to use. “For example, most student grade watercolours contain too much ‘filler’ to re-wet well. They may dry up and crack and fall out of the palette. To overcome this you can try adding a tiny drop of honey or glycerine to the colour well and stir it very well, or use Artist quality watercolours.